If you're someone who has a large volume of photographs then Photovault can help you organize, publish and manage them with relative ease. 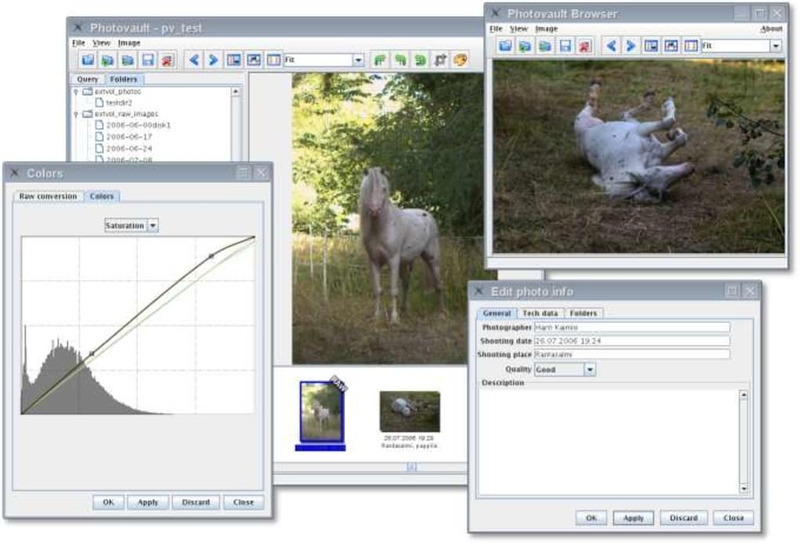 Considering it is free, the program is surprisingly powerful, with the capacity to take thousands of photos and package them neatly into virtual folders. For amateur photographers the program is a dream and includes tools for RAW format conversion, colour correction, cropping, rotating and brightness/contrast balancing. We were also impressed by the way it allows you to sort your images using the metadata stored within the picture files. Not only does this help you organize your collections by date, but you can also sort on a wide range of other variables, such as location, time of day, name or photographer. Although you won't find many fancy special effects tools within Photovault, the program performs a decent job of whipping your snaps into shape. Photovault is a photo workflow and archiving application intended for photographers. With it you can easily keep even a large photo archive in good order, find the images you need and do the normal image processing tasks in all phases of your workflow, including raw file conversion, color corrections and image cropping and rotation. What do you think about Photovault? Do you recommend it? Why?